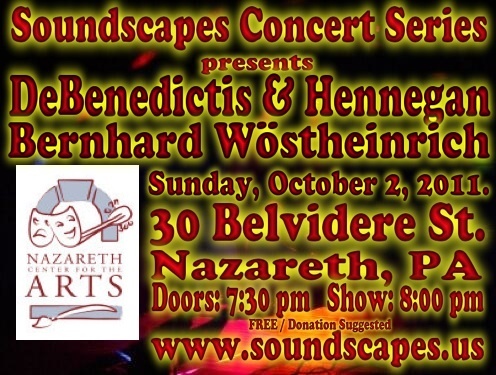 Here is the archive of Soundscapes Concert #14 featuring Dean De Benedictis and Vic Hennegan and Bernhard Wöstheinrich. It took place at the Nazareth Center for the Arts on Sunday, October 2, 2011. Bernhard played the first set and Dean and Vic played the second. DEAN DE BENEDICTIS: Dean's music is the result of his will to tie an essential common thread together between opposing genres and mentalities as well as draw from them a natural sense of emotion, expanse and mystery. This Southern California-based visual and conceptual artist, known as Surface 10, has always utilized his interest in a variety of styles and cultures to enrich the quality of his musical expression. VIC HENNEGAN: An artist and a spiritualist, Hennegan contemplates the state of humanity through his music. Hennegan's instinctive hand creates techno-trance and ambient music in a wildly fun, uplifting spiritual experience that will take your soul on a journey to the center of ecstasy. His music emanates a unique warmth which moves the listener to a state of euphoria. BERNHARD WÖSTHEINRICH: Bernhard leads his own solo project "The Redundant Rocker" and his main collaborator is Markus Reuter (in CENTROZOON). He has also worked with Ian Boddy, Klaus Hoffmann-Hoock, No-Man singer Tim Bowness, Thorsten Niestrath, and Synapscape's Philipp Münch. Here is a short clip from Dean and Vic's set. Music ©2011 Dean De Benedictis and Vic Hennegan. All rights reserved. Here is a short clip from Bernhard's set.